Curiosity struck the newly reformed ice cat of a story that spread across the New Mobotropolis and Station Square of a race between his idol Sonic the Hedgehog and someone named Rainbow Dash. After talking to Tails about the race, it seemed that the opponent was in a world called Equestria. With the dimensional portal device still up in tact, he decided to add Equestria to his list of new worlds to explore. What he found there was completely unexpected as he was greeted with colorful talking ponies. As he tries to settle in, he can't help but to hear a muffled yet familiar beats coming from one of the houses. Once he discovered that there's a cool looking DJ playing sick beats, the rest as they say is history. One week later with some practice on the synthesizer, the DJ Duo sent an invite to an inter-dimensional party to what will later be known as The Best Ultimate Rave Ever! There are so many crossover comparisons between Sonic and MLP that there isn't any good parings with the rest of the Mobian cast or the side ponies that show up during the episodes. This feline already has his cool factor before Gen 4 was even out. 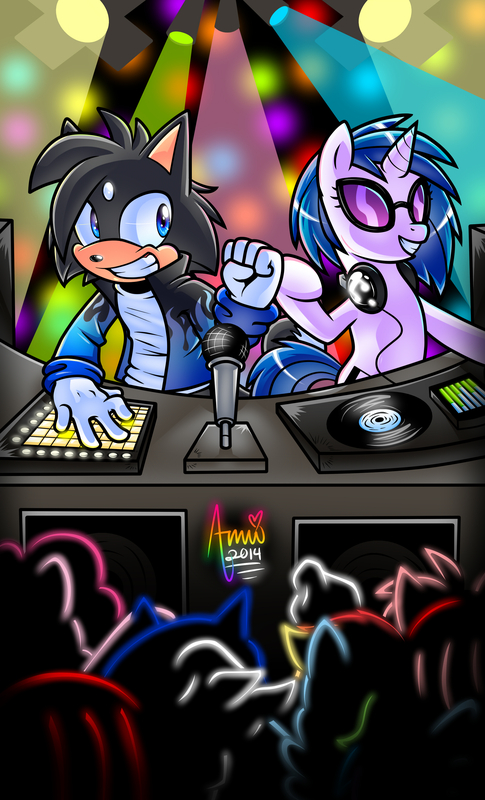 With the cool and sick beats that Vinyl Scratch dishes out, it was only a matter of time that I wanted an epic crossover pic with her. This was totally one hell of a beyond epic pic that Amu made and totally worth the wait. I honestly thought it was only going to be just me and DJ-PON-3 but I would never expect the neon outlines of the main cast of both series nor the extreme detailing that he did for....well.....EVERYTHING! Especially the "True Potential" and "At the Gala" version. If anyone is looking for awesome artwork, I highly recommend going for Amuzoreh. This is one for the book of unspoken awesomeness.